Peer Instruction has been getting rave reviews. Eric Mazur, a Harvard Professor of Physics, holds that learning proceeds at (up to) triple it’s normal rate! And, with very little input from him… he’s even known students to feel it unfair that they’re doing all the work. After thinking, students then vote on the right answer – showing a distribution of responses – perhaps using a PRS or something like plickers. The teacher does not give any indication which answer is correct. Now students can see the distribution of responses, and must next discuss – trying to convince each other. Finally and after discussion, students vote again. Something to get you thinking: oddly enough, classes typically arrive at the right answer – why might that be? Does it help learning? When done correctly, repeated studies have shown a large effect size equal to moving your GCSE grade up an entire grade – e.g. from an A to an A*. Some studies show even greater gains. But better than exam results, Professor Mazur has show many other benefits too. Communicating complex ideas, working in teams, developing flexibility in thinking and also a deep understanding of complex theories. Moreover, it’s fun. Singapore, Australia, Shanghai, Korea, Finland and Ontario – What do top performing education systems all have in common? One thing really stands out. One thing which would be easily transplanted, at almost no cost. It is the power of ‘Not Yet’ as Carole Dweck calls it… a pervasive belief that failure is not permanent and that success comes with effort. Teach ‘brainology’ – an understanding of how neurological networks grow and respond to experiences, stressors and growth mindsets. Redefine ‘effort’ and ‘difficulty’. Fascinatingly, Dweck found a growth mindset enabled impoverished pupils to overcome disadvantage with highly unexpected results. Her talk is an exceptionally good use of 10 minutes. A neat bit of secondary data research appears to show that stress kills. No surprise there, except to say, there’s a catch. Keller et al. (2012) looked back at a 1998 study, and matched 28,753 participants’ mortality against both their stress levels and their attitudes to stress. It would seem that being stressed, and believing stress is unhealthy leads to 43% increased risk of premature death. This compares rather well against those who are stressed but not worried about the heath effects of stress. Kelly McGonigal talks about this in her 2013 TED talk – How to Make Stress Your Friend. She highlights a number of other ways in which people’s attitudes to stress can affect physical health – if we believe it so. The implication for schools is quite profound. We already know that children with a Growth Mindset will do better, be more resilient and develop in more well rounded ways. It would not be hard to weave in to this, the promotion of positive attitudes to stress. This appear to bring many protective qualities. Having been a science and computing teacher, I commonly hear people say “but your subjects lend themselves well to PBL” and I wonder what they mean. Of course, it’s true that there are many great opportunities for PBL in science and computing; but these also need ‘enabling knowledge’ to be in place. In some subjects including computing, there is a real dynamic tension between this enabling knowledge, and further knowledge growth. I wonder if it just looks simpler for unfamiliar subjects? Pedagogical approaches in ICT exemplify this. Before students can program, they need certain mental constructs. Variables, Loops, Decision Structures and their like. However, in the application there is a dance back and forwards as mental constructs are built, enacted and extended. 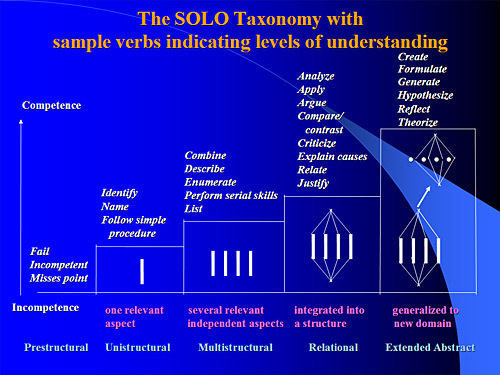 In the language of SOLO taxonomy, learning uni-structural concepts allows multi-structural and relational exploration. But, along the way, new facts are uncovered as uni-structural facts, needing to be integrated … it’s a dance that goes back and forwards. Not all curriculum designers understand this dance… When I was taught computing, the approach taken in COMP 111 and COMP 112 was to cover all relevant uni-structural concepts first. Then we looked at all multi-structural extensions and at the end of the year, we wrapped up in a lightweight relational project. It wasn’t the most interesting to say the least, and the subject was notable for the fact that it was unpopular and 95% male. Now if I was going to construct this course myself, I might be tempted to offer a little bit more support in the development of FORTRAN knowledge… but the principle then was sound. The problems were interesting, challenging, real-world and very very fun. Pupil uptake was high and attainment was equally satisfying. Creating a Natural Critical Learning Environment begins with raising big questions that students will find important, intriguing, or beautiful. … building courses around big questions, often questions that are bigger than the course or the particular discipline. The idea is to get students engaged in a question or problem, and as they pursue that question they learn. . .history, chemistry, journalism, or whatever. They also develop the powers of their own minds. Of course, it is still necessary to make pupil’s thinking visible. To build, extend and challenge thinking. In SOLO language, to go to the Abstract and Extended-Abstract. While PBL offers many opportunities here, we also need the techniques known to many good teachers, that are promoted through the likes of Harvard’s Project Zero which I highly recommend. This combination of PBL as canvas, and the application of diverse learning tools (the teachers’ pallet) makes for real magic in the classroom. Coming full circle – it this easier in computing and science? No, it requires deep thinking about the learning process in each subject and intricate planning. The one advantage computers give is the immediacy of feedback – but properly trained, peer feedback can be just as immediate and as Eric Mazur at Harvard has shown, can lead to significant learning gains. Furthermore, a key element of PBL is the engagement of ‘real world audiences’ … giving rather effective feedback! Education research must be really frustrating for many as it appears to contradict itself over time, and differing settings. This situation reminds me of story given by Martin Seligman (2004) in his very entertaining TED lecture. The same story, I suggest, might apply to educational effectiveness research. We have made great strides over the last fifty years highlighting many things which contribute to learners’ success. And this has been good. However, at times research has been too dogmatic, ideological and bound by distinct paradigms. Much of the early debate around traditional vs progressive education might fall in to this camp. At its worst, this has led to the teach-by-numbers approach that has de-professionalised teachers and short changed learners. This is not good. We have learnt that our former quantitative tools were blunt instruments that only weakly pick up on complexity, interactions, non-linear effects and the very contextual nature of learning. If at all. This is not to say that prior progress is illusory – far from it; but it is now appropriate to ask ‘what next’ as our research power improves. Now with much greater technical finesse, better data, mixed methods and a generally more pragmatic approach research may shine a light on old and new dilemmas. Former pivotal studies such as Coleman (1966) are being reanalysed and reconsidered (Borman & Dowling, 2010) and we are finding answers to previously impossible questions – e.g. such as the temporal and contextual impact of leadership (Day et al., 2009) and its impact on student attainment (Connolly, 2015). It is easy to see how early efforts were ‘good’, some application of these became ‘not good’ but with new methods and more computational power, we can now improve on ‘not good enough’. An example of this is the recent report of the US National Mathematics Advisory Panel (2008) which highlights early antagonism between traditional and progressive paradigms. However, advice now moves beyond this to a pragmatic mix, which recognises that a blend of approaches is required. So too, when we consider problem based learning; for which a dogmatic application of pure PBL is not good (Walker, Leary, Hmelo-Silver, & Ertmer, 2015). Also not good, is an uncritical application of Hattie’s Visible Learning (2009) which deserves close scrutiny and a revisiting of sources at times. Borman, G., & Dowling, M. (2010). Schools and Inequality: A Multilevel Analysis of Coleman’s Equality of Educational Opportunity Data. Teachers College Record, 112(5), 1201–1246. Connolly, V. (2015). Leadership, School Culture and Attainment: a secondary data analysis of TALIS 2013 (England) (MPhil). University of Cambridge, Cambridge. Walker, A., Leary, H., Hmelo-Silver, C., & Ertmer, P. A. (Eds.). (2015). Essential Readings in Problem-Based Learning: Exploring and Extending the Legacy of Howard S. Barrows. West Lafayette, Indiana: Purdue University Press. Polyglot Benny Lewis learned languages late in life. Through his experience, he challenges traditional notions of learning and believes that learning languages can be made easy if learners are passionate about literature, people and culture. Instead of a formal method, he advocates a more PBL approach, where the problem is “how do I survive on holiday?” or “how do I communicate with people?” … but certainly the problem is not “how do I pass this exam?”. Speak the language out loud from day one. Beginners shouldn’t be afraid of mispronouncing things or sounding unpolished, Lewis says. It’s most important that they start practising — aloud — right away. Learn practical phrases first. New language learners should aim for phrases like “bathroom where?” that will help them communicate about basic needs. “That’s not very eloquent, but it’s totally understandable,” Lewis notes. Forget about learning strict grammar. As part of getting basic vocabulary and phrases down, Lewis says people shouldn’t worry too much initially about learning the rules of grammar. Those can be filled in later. Practice by Skyping with a native speaker. One of today’s best language learning tools, Lewis says, is the Internet — specifically video chats like Skype. Using these free services, an English speaker in New York can easily get free or cheap conversational lessons from a native speaker of another language elsewhere in the world. Listen to local radio stations. Another option for immersing yourself in a foreign language is to stream radio from a country that speaks it. To do this, Lewis recommends checking out TuneIn, an online repository of radio stations from around the world. Practice a one-minute introduction to yourself. One of Lewis’s favorite tricks for beginners is to have them write out a short introduction to themselves, and then work on translating it with a native speaker. This relatively quick activity teaches plenty about basic vocabulary and phrases. Avoid generic language courses. Lewis discourages people from signing up for classes like Rosetta Stone, which he feels are too generalized to help the average beginner. At that stage, he says personalized feedback is the most important thing to have. Instead, check out free language-learning tools online. Duolingo is one of Lewis’s favorites, as well as italiki, an online site that connects you with native speakers for personal language lessons. Be prepared to put in a lot of time and practice. Lewis believes that people who are willing to study a foreign language full-time could reach a B2 level in just a few months. On the other hand, he thinks the same level could be achieved in a year or two with one to two hours of practice each day. Don’t aim for perfection. The problem that most beginners run into, Lewis argues, is that they become so focused on reaching a perfect end-stage that they get discouraged and never get past the early stages. The best way to deal with this? Get comfortable with mistakes, and don’t try to be perfect. These look remarkably like standard based PBL where projects are real-life and authentic, varied, multidisciplinary and FUN. And with respect to those GCSE exams, Lewis contends that after learning a language conversationally, it is then appropriate to return to a more formal learning of grammar / exam prep… but by this point, even that would look fun. For a similar story, Joshua Foer uses Memrise to learn African tribal languages. Education debate is all too often polarised. And so it is with Problem Based Learning (PBL) and the work of John Hattie (2009). One does not have to dig that deep to find often contradictory meaning. For example, homework is touted as a weak to moderate influence on student attainment – yet a closer look reveals that this is merely an average of two very different pictures. For primary pupils, homework is of little benefit to their academic progress. For secondary pupils, the picture is very different – as any teacher will know, homework in the right circumstances is a powerful learning support. However, we can take this even further – really effective homework targets areas of weakness needing attention, rather than mechanistic repetition (Stobart, 2014) – perhaps we could say homework is personalised? A progressive concept of which Hattie disproves. Or does he? In Hattie’s overview of educational interventions PBL is ranked a very lowly 118th. With an effect size of 0.15, problem based learning is barely better than ‘just leaving children to get on with it’ … However, there is a wide variation in the eight meta-analyses that Hattie synthesises and it is worth exploring these meta-analyses individually. To believe Hattie, PBL is detrimental to knowledge acquisition. He quotes Dochy et. al. (2003) showing an effect size of -0.78 on the acquisition of knowledge. This is equivalent to the loss of over one year’s teaching! If this were true, it would be enough to dent the ardour of any teacher. However, Dochy et. al. do not believe in the robustness of their own result – and state “this result is strongly influenced by two studies and the vote count does not reach a significant level. It is concluded that the combined effect size for the effect on knowledge is non-robust” (ibid: 533). What Hattie is very positive about is the impact of PBL on skills acquisition (d = 0.66) and knowledge and complex theory retention (d=0.75). It is this level which is most important at ‘A’ level’s higher grades which require synthesis and deep thinking. What is PBL best at doing? What should PBL be combined with to give maximal benefit? How is PBL moderated by age and subject domain? Does PBL equally suit all learners, irrespective of their baseline? Early research methodologies lacked much sophistication and ‘resolving power’. The field of educational effectiveness research has only latterly been able to explore interaction effects and non-linear relationships and we should be alert to the weaknesses of past research. Day et. al.’s (2009) exploration of the developmental pathways that schools travel is a fascinating example which illustrates the weaknesses of a ‘one size fits all’ approach. It should be no surprise that PBL should be similarly blended with other techniques as befits each learners’ situation. For one example of how PBL is combined with academic rigour, watch Marc Chun’s Keynote to PBL World 2013. BBC News, 2014a. Phonics lessons are “almost abuse”, says academic [WWW Document]. BBC News. URL http://www.bbc.co.uk/news/education-25928432 (accessed 7.23.16). BBC News, 2014b. Headteacher: Phonics is the “best way” to teach reading [WWW Document]. BBC News. URL http://www.bbc.co.uk/news/education-25928436 (accessed 7.23.16). Day, C., Sammons, P., Hopkins, D., Harris, A., Leithwood, K., Gu, Q., Brown, E., Ahtaridou, E., Kington, A., 2009. The Impact of School Leadership on Pupil Outcomes: Final report (DCSF-RR No. 108). Department for Children, Schools and Families, London. Hattie, J., 2009. Visible Learning: A Synthesis of Over 800 Meta-Analyses Relating to Achievement. Routledge, New York. Stobart, G., 2014. The Expert Learner: Challenging the Myth of Ability. Open University Press, Maidenhead.